Performing stereotactic breast biopsy with great accuracy, skill, and efficiency—without compromising quality—is critical not just for radiologists who are breast imagers, but also for their patients. 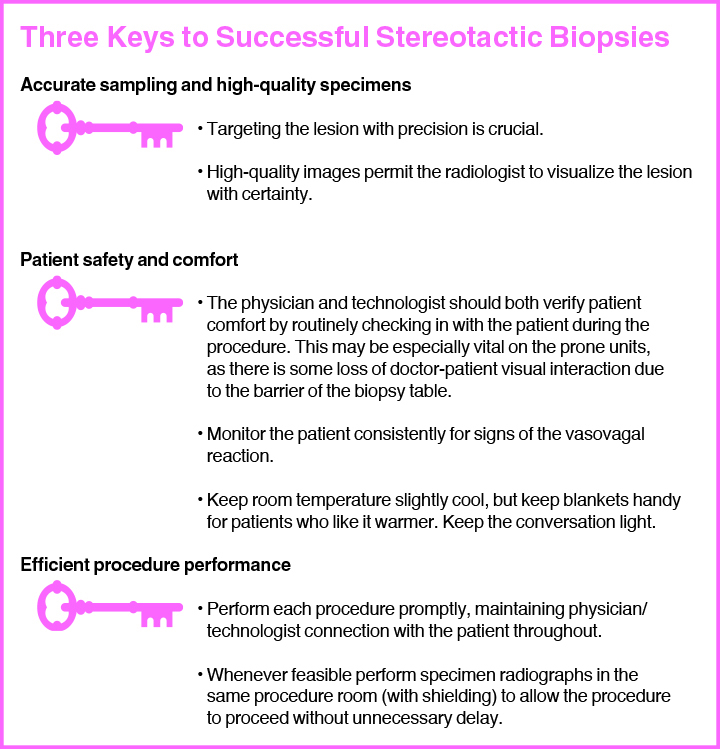 The radiologist’s primary goal in performing stereotactic biopsy, of course, is to obtain ideal breast tissue specimens in order to avoid having their patients undergo an open breast biopsy in the operating room. Open surgical breast biopsies are far more costly and risky for patients compared to stereotactic biopsies. Collecting high-quality stereotactic specimens avoids excessive healthcare expenditures and cosmetic disfigurement to the breast. Furthermore, stereotactic biopsy requires no sedation—only local anesthetic. Most patients don’t complain of excessive discomfort during their stereotactic biopsy, but there has been some debate among radiologists regarding this question: Which is more comfortable for patients—upright or prone stereotactic units? Most initial stereotactic units were upright, followed by a perceived preference for prone units. Now, with 3D digital tomography stereotactic methods, some radiologists have returned to the upright approach. 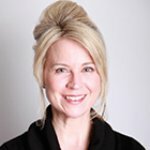 In a study by Schrading et al, upright units with digital breast tomosynthesis were believed to prevent difficulties associated with the small biopsy window of conventional prone systems.1 Some radiologists have stated, however, that upright systems can be associated with vasovagal reactions, and those doctors prefer the prone systems for their patients. Whether systems are upright or prone, radiologists should be able to visualize and target breast lesions with great precision, whether they are best seen on conventional mammography or on digital breast tomosynthesis units. Finally, radiologists must recognize that, to prevent the need for an open biopsy in the operating room due to an inability to acquire excellent tissue specimens, they must leverage the technology of stereotactic biopsy in the most efficient manner possible. To confirm that the suspicious microcalcifications or masses are being sampled, the radiologist should have ideal visualization of the region of interest containing these lesions. Image clarity is essential; the radiologist should be able to target the region of concern with laser-sharp accuracy and precision. The radiologist must then verify that the microcalcifications are contained within the collected specimens, at which point specimen radiographs are necessary before the samples can be sent to pathology for evaluation. In many cases, the technologist must leave the room to obtain a specimen radiograph and take additional time for processing. To improve efficiency, an alternative would be to have the patient’s specimens radiographed in the same room, with proper shielding in place. As we continue to evolve and improve our processes with stereotactic biopsy, we should strive to make the procedure more efficient and comfortable for our patients. Stereotactic biopsy is a winner in terms of comfort, convenience, and cost-reduction for patients, and will continue to be further refined as we streamline our processes now and into the future. Schrading S, Distelmaier M, Dirrichs T, et al. Digital breast tomosynthesis-guided vacuum-assisted breast biopsy: Initial experiences and comparison with prone stereotactic vacuum-assisted biopsy. Radiology. 2015;274(3):654-662. Conway S. Improving stereotactic breast biopsy. Appl Radiol. 2016;45(11):38-39.